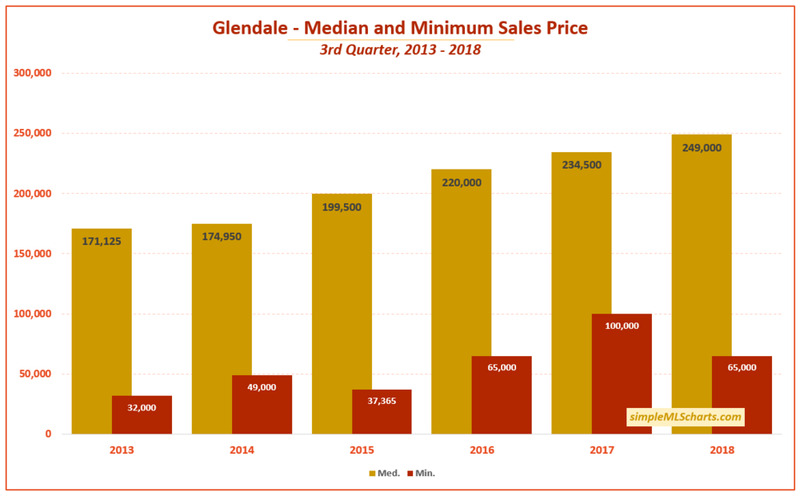 Looking at the Median and Minimum Sales Price in Glendale, and comparing 3rd Qtr sales over the last 6 years, well - it doesn’t take a rocket scientist to see the upward trend. Yes, the least expensive home in Q3 2017 was higher than 2018, but that doesn’t take away from the 6-year trend. The Median Sales Price in Q3 2018 was $249,000, up 6% from 2017’s $234,500 and 45% from 2013’s median of $171,125. 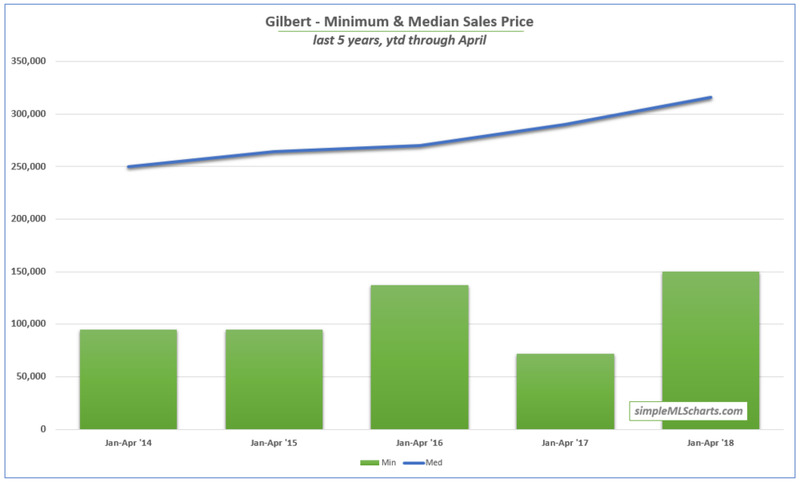 The minimum sales price in Gilbert (ie: the single lowest price home sold, green bars) has been sporadic over the last 5 years, with the trend showing slightly positive but with the single lowest price recorded last year, in 2017. That being said, the median sales price (blue line) has climbed steadily during the same 5-year time span, with each year being higher than the last. Anything can happen when you're looking at one specific event (minimum), but the truth comes out when you're looking at the overall market (median). Homes are more expensive in 85395. The lowest-priced home which has sold year to date was 32% higher ($167,000 in 85395 vs $127,000 in 85338), and the Median Sales Price is 30% higher as well ($325,000 vs $250,000). I don't know which is more impressive - that Chandler's Median Price in the first quarter is $316,500 (up 8.6% YoY and 32% since 2014), or that the Minimum Price - the single lowest priced home that closed escrow last quarter - was $135,000. Check out more Simple MLS Charts. Read about using email and building a tribe. Learn about my full featured eNewsletter service. Looking at February prices in Goodyear over over the last 4 years, the minimum and median prices both fell slightly in 2016 before increasing in 2017 and then rising even further in 2018.